Day + 5 Still managing a smile! Day + 4 Nothing new! Today was pretty much the same as the past couple of days for Orla. Sleeping, a couple of salt baths, TV, music therapist, singing, playing with her balls, more TV, story books and generally messing about, pulling and attempting to eat her nasogastric and IV lines…..etc etc!! She even buzzed the nurse looking after her this morning when she woke up from her nap, I was out of the room, all by herself…..!!! The stomal therapist came to see her by my request this morning as the new bum regime wasn’t working too well namely because it was sticking her cheeks together! We now have another regime which combines all the regimes used to date and should protect Orla. We are however fighting a losing battle as her neutrophils are heading to zero now thus she is almost at her most vulnerable from an infection perspective. The doctors remain comfortable with her progress. The ward has become very busy over the past couple of days with some very sick children moving in. The nurses are very busy and we are not receiving a great deal of attention because Orla is very well in comparison, we are definitely not complaining! She is to have another dose of Folinic Acid tonight and then the steroids should be stopped tomorrow! Orla woke screaming this morning in pain from her bottom and had uncontrollable diarrhoea. It wasn’t a good start, my initial response was “here we go”. The diarrhoea has settled as her nasogastric feed rate has been decreased, her bowel isn’t able for alot at present but this is expected. The nurse contacted the stomal therapist who suggested a different regime for her bottom so hopefully this helps, it is too soon to say at present. This morning was the first day she refused her breakfast and dry retched as I offered it to her. She has had happy moments but the effects of the chemo are heightening and she tires more easily. She is still doing well from the BMT team’s perspective. The BMT coordinator commenting to say she looked better than she expected and that she really doesn’t look much different other than pale. We are waiting for her to get a temperature and the effects of the mucositis to worsen which we are told will happen over the next couple of days. She had another dose of Methotrexate this evening, one more to go now!! She is being administered numerous medications to manage the uncomfortable effects of the chemo but it is hard when they cant’ tell you what is wrong…..
Orla had a pretty good day today. She isn’t really eating now as she has to avoid dairy products which was all she would eat! We have sourced some lactose free formula which she likes and she had a small amount of cordial. She is basically receiving all she needs from the nasogastric tube feeds now. She has some sores appearing in her mouth which is the beginnings of Mucositis a side effect of the chemotherapy. This will potentially extend through her GI tract this week. She hasn’t had a temperature today and her blood pressure was more normal and so no need for medication. She received what is known as a Folinic acid rescue, which rescues the good cells that the methotrexate (chemo she was given yesterday) has destroyed. Ed mentioned to the BMT doctor this morning that she has been hysterical when I leave the room and she told us that the older kids receiving BMT say they feel terrible at this point in the journey so this makes sense. We are giving her as much TLC as we possibly can and she still remains generally happy. Day +1 The fun and games begin…..
Orla slept extremely well last night possibly due to the continuous nasogastric feeds she is now receiving or she may have been simply really tired after her big day. The bone marrow infusion was completed last evening without any adverse reactions and she remained happy throughout so we were thrilled. Although the transplant of the new bone marrow is now complete, we are far from out of the woods. It will be at least a couple of weeks, potentially longer, before we know if the transplant has been successful. The new marrow needs to set up camp and settle in Orla’s body and be accepted. An internal war could go on in this time between the new cells and any old ones left and potentially make Orla very sick at times. This morning she woke as her normal happy self, had breakfast in her high chair followed by a bath and then a nap. However she unfortunately found it hard to settle for a sleep this afternoon more than likely due to the steroids and then became over tired and hysterical at times. Her bottom is hurting and her teeth appear to be too as her top molars are coming through. Her blood pressure has been a little high and her temperature has been up just a little too. She is not able to have paracetamol to settle her as it will mask a temperature so she is on some stronger opioid medication. She is being watched closely, a registrar came to see her tonight and then spoke to the on call consultant and she received a single dose of an antihypertensive medication which has brought her blood pressure down to normal limits. The increase in her blood pressure is more than likely due to the immunosuppressant medication, Cyclosporin. Her temperature is regularly checked and if it reaches 38 degrees celsius or above, she will have blood cultures taken and started on an additional antibiotic to that which she is on. She was also started on yet another medication tonight called Methotrexate which is a type of chemotherapy. This is given to reduce what is known as graft v’s host disease which can be pretty nasty. Ed and I believe she is feeling pretty scared at times. She copes really well and then she has moments where it all becomes a little too much. In fairness we know how she feels as we have moments like this ourselves at times! The staff are all commenting on how well she is doing though which is positive. Day 0 – Orla’s Day has come! 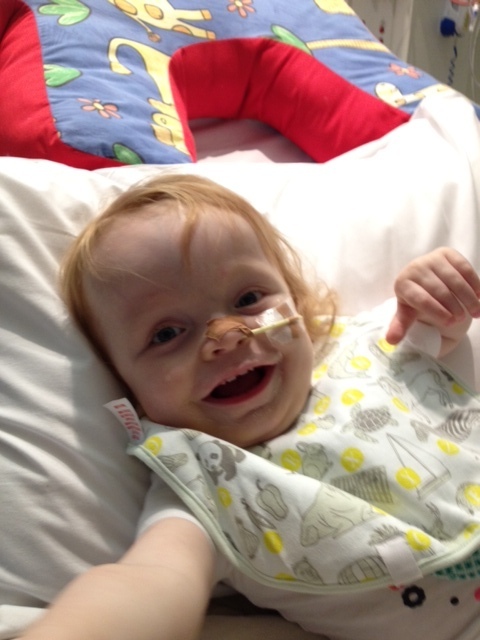 Today is Day 0 – transplant day…. hard to believe we are here. The bone marrow arrived in this morning from somewhere across the globe. 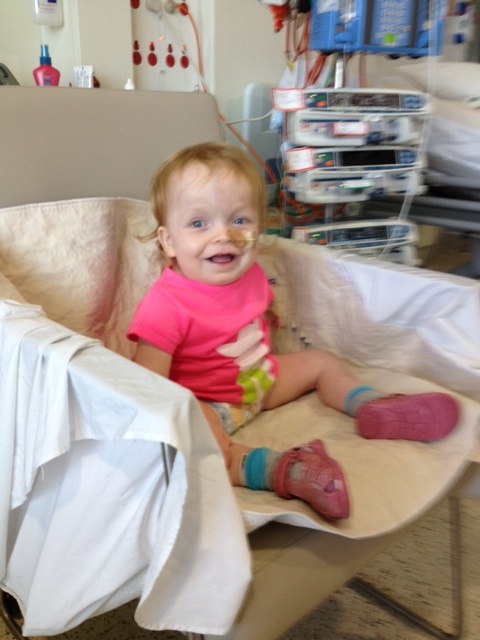 It was personally accompanied by a very responsible individual who may have been attending a conference where the donor was located or otherwise a staff member from the collection or RCH lab may have flown to bring it back to Melbourne for Orla. It is an amazing process. Since its arrival to the royal children’s it has been in the hands of the lab staff where they are checking the number of cells and washing it to try and remove any red blood cells. The donor is an incompatible blood type to Orla hence they wash as many red blood cells away to try and make it pure bone marrow stem cells. It will be given in the same way as a blood transfusion and we are told it really isn’t very exciting but we are hoping to celebrate with a drink which the doctors are in full support of even if the hospital administration isn’t! We are currently waiting in Orla’s room for the marrow to arrive. There is a chance that Orla will have an allergic type reaction to the cells as they are simply not “self” so she has been given the same medication as prior to each ATG dose to try and avoid or at least reduce the intensity of this. There will be a nurse and a doctor present for the infusion and it will take between 20 mins to an hour. The rate of infusion will depend on how well she tolerates the cells from an allergy perspective and balancing not to overload her with fluid. The amount of intravenous fluids she is having has been increased today to make sure her kidneys are flushed. She has also started feeds through her nasogastric tube as she is not drinking and eating much now and the chemotherapy has also probably made her lactose intolerant. The chemo damages the cells lining the gastrointestinal tract and can also cause the lining of her mouth to breakdown so she is also on a strict mouth care regime too. I will write more when it’s over, we are starting to feel nervous now in anticipation…..!! Orla had a lovely day today. She was tired tonight and slightly unreasonable but she had exerted alot of energy playing throughout the day. She played with Nan, the music therapist and generally messed about and she also moved rooms! She has her very own portable DVD player which the charity challenge have lent to her while she is in hospital and she loves it! She is having a salt bath twice a day to help with her bottom which is pretty sore and the skin has broken down a little. We are being vigilant with applying barrier creams and also using some oxygen therapy. Mum enjoyed a bit of time out while Nan is around and Dad is on the night watch tonight. The new bone marrow is currently on a jumbo jet and due to arrive into Tullamarine Airport tomorrow morning and be taken to the lab. Orla will receive it sometime tomorrow evening. Orla has finished her final dose of ATG today which completes her conditioning phase and she really has coped as well as we could have hoped. She vomited once yesterday morning and is slightly off her food but is still eating and drinking and has a substantial amount of energy!! She is making a bit of a name for herself here in the BMT suite for being a little character who isn’t fond of sleep! One of her favourite activities presently is to almost jump up and down in a sitting position and the doctors started a trend by joining her for a jump yesterday while on their ward round, quite the site when dressed in gowns and masks!! The nurse just checked Orla’s Neutrophil count (white blood cells) which has now started to drop which is a sign of the conditioning working. Her Hickman line dressing was done today, this will be performed every week until it is removed. I wasn’t here but Mum was along with 3 nurses and a lady from an organisation called Comfort first who work to calm and distract children in the oncology area while they are having procedures performed. She coped really well with this too. Orla will have to take some medications to suppress her immune system on an ongoing basis possibly for the next 12 months or more, one of these was started today. It is called Cyclosporin. The anticonvulsant medication was ceased as there is no longer a risk of her fitting from the chemo agents. Tomorrow is a rest day. The reason for this is to ensure the chemo agents have been removed from the body in time for transplant on Friday and don’t act on the new the donor cells. I’m signing off and going to eat some Apple and Rhubarb crumble which was prepared by a chef who comes in once a month to cook dinner for the parents on the cancer ward which BMT is part of…yum!